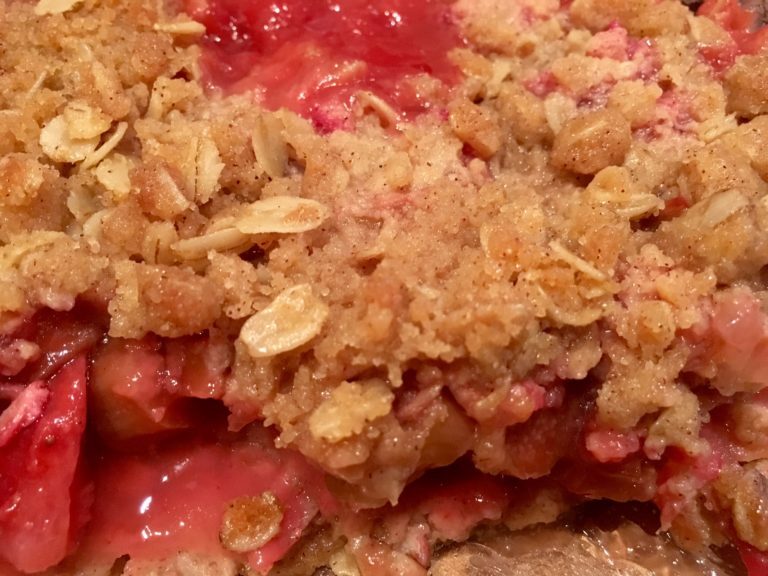 I love strawberry rhubarb crisp. It just looks and tastes like spring to me. The bright red color of the rhubarb is beautiful, and I even love the tart flavor. This recipe is great made with just rhubarb too, although strawberries add both color and sweetness. If I’m using only rhubarb, and it’s mostly green, sometimes I’ll add a few drops of red food coloring to the sugar and water. Heat the oven to 350 degrees. Butter an 8-inch square baking dish. In a mixing bowl, combine brown sugar, flour, oats and cinnamon; stir in melted butter, mixing together until crumbly. Press half of the brown sugar and oat mixture into the prepared baking dish. Top with the strawberries and rhubarb. In a saucepan whisk together the 3/4 cup granulated sugar with the cornstarch; add the water and vanilla. Cook together, stirring, until mixture boils and is thick and clear. Pour the thickened syrup mixture over strawberries and rhubarb in the baking dish. Top with remaining crumb mixture and bake in the preheated oven for 45 to 55 minutes or until the topping is browned and the filling is bubbling.